Photo: Late light, Rach Gia harbour. Set on the eastern edge of the Gulf of Thailand and 270 kilometres by road from Ho Chi Minh City, Rach Gia is a bustling port, transit point, gateway and capital of Mekong Delta province Kien Giang. Most find themselves in Rach Gia (pronounced “Rat Yah”) en route to somewhere else – that “somewhere else” most popularly being Phu Quoc island, a 2.5-hour fast ferry ride or 35-minute flight away. Rach Gia is also 90 kilometres to the Cambodian border, a choice way to get to Kep. Finally, Rach Gia is the jumping off point for the little known Nam Du, an archipelago of 21 islands and islets that we’re trying to put on the map. Despite once a day fast ferry service, few foreign travellers venture to Nam Du and Hon Son, islands that offer dramatic landscape, lush jungle, pristine white sand beaches, crystal turquoise waters and a banquet of seafood. Intrepid travellers who love off-the-beaten track, take notice: it’s magic. The most people will see of Rach Gia is on their ride from the pier to the bus station and vice versa, but the city is not a bad spot to spend a night. Locals like to hang out on the large bridge in the evening and vendors even set up shop on the footpath, but there’s more fantastic sunset spots much further south on Ton Duc Thang Street, the coastal road. Look for Ben Du Thuyen Cafe, with bistro tables on a promenade at the water’s edge, along with a pier that runs to Tay Long floating restaurant. Gazing out to the horizon on a calm day, it almost feels like you at the edge of the earth. Aside from gazing at the ocean, the city has a couple of minor points of interest to occupy some time. File these sights under “if you’re in Rach Gia and really bored” category. Nguyen Trang Truc Temple, dedicated to Rach Gia’s favourite martyr, is located at 18D Nguyen Cong Tru. The bust of Nguyen Trung Truc stands out in front and there’s a small English-language explanation of his undertakings inside: He led attacks against the French in the mid 19th century and despite repeated attempts to capture him, the French never quite managed it. Eventually they grabbed his mum and a few other citizens and threatened to knock them off if he didn’t surrender. Surrender he did, and the French executed him in the marketplace in October 27, 1868. To give you an idea of how deserted Kien Giang Museum (bao tang Kieng Giang) is, staff had to switch on the lights for us. On display in a French colonial building are skulls and Oc Eo artefacts such as jewellery and pottery dating back to 100-600 AD, some Khmer cultural costumes, black and white war photos and of course, an homage to Ho Chi Minh. There are some captions in English but all interpretation is in Vietnamese. Most will find it underwhelming. Perhaps marginally more interesting is the stuff outside the building. On display behind a fence is a US army helicopter wing, bomb casings and a 10-metre long whale skeleton that was found in 1972. Admission is free. Open Mon-Fri 07:30-11:00, 13:30-17:00. You’re probably thinking, “Get to the Phu Quoc part already.” Okay. Weather permitting, the memorably named Superdong fast ferry makes the 2 hour 20 minute journey to Phu Quoc daily. There are at least three departures a day, with an additional departure possibly added on weekends in high season and holidays. Superdong is efficient and orderly, with assigned seating, air-con and comfortable chairs. Full details are found in our Transport section. During rainy season between May and June, departures are usually reduced to twice a day. Boats are cancelled when water are rough (high winds). 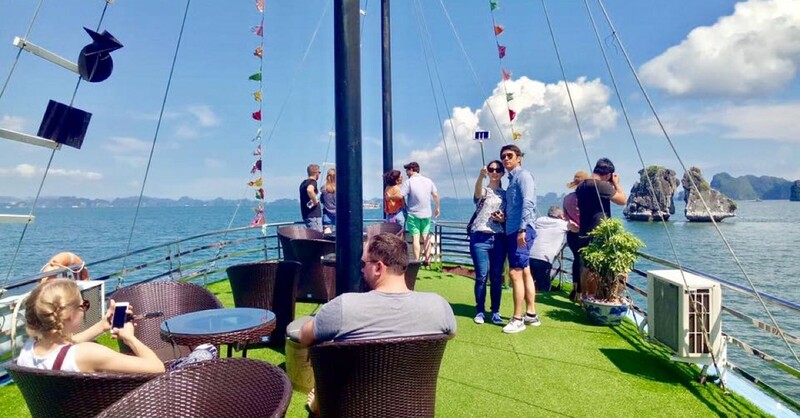 It could be days before boat are able to resume, so factor in doses of patience or quickly book a flight to Phu Quoc as there are few and they fill up fast. Keep all this in mind if you’re tight on time and have wedged Phu Quoc into the last few days of a Vietnam trip. Most travellers will remain in a concentrated area located on an island formed by the Cai Lon River. There are a number of hotels and eateries, and you are close to the pier which is located at the western end of Nguyen Cong Tru. The market and central bus station (serving a few regional destinations) is also close by. But Rach Gia is large and growing, with bridges leading out to a considerable amount of new development sprawl and cafes and pubs lining the water. The main bus station which handles the bulk of the destinations is located seven kilometres southeast of town. Rach Gia airport is 10 kilometres from town, out in the same direction as the bus station. Meter taxis are hard to come by. You won’t necessarily encounter one standing on the street; your hotel can call you one and it may take a few minutes before it arrives. Taxis and xe om are of course on hand at bus stations and the pier. ATMs are easily found throughout the city.  Please sign up as a Travelfish member to download the Rach Gia guide PDF (1 MB, 14 pages). Membership costs just A$35 per year (less than A$1 per week) and gives you access to over 250 PDF guides. Last updated on 14th October, 2016. Browse our independent reviews of places to stay in and around Rach Gia. Read up on where to eat on Rach Gia. Read up on how to get to Rach Gia, or book your transport online with Baolau. Planning on riding a scooter in Rach Gia? Please read this. 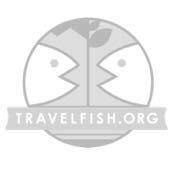 Use the above map to find specific destinations in and around Rach Gia which are listed on Travelfish. Bed icons indicate a guesthouse, hostel or hotel, the knife and fork is an eatery or bar and the four-way circular thingy marks sights, attractions and other points of interest. Click on any icon for a short pop-up and a direct link to the page for that spot. If you are in the area, use the teardrop icon near the top left to show your position on the map (you'll need to allow position sharing for this last feature to work).